A new technology developed in the US which could revolutionise the way the world’s waste water can be processed is being tested by experts at Scottish Water. 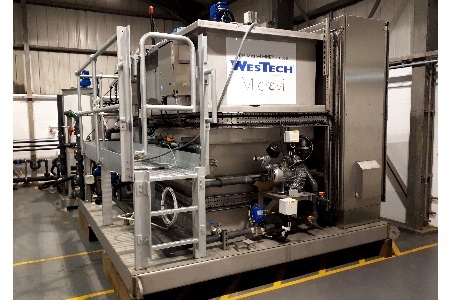 A six month trial of Microvi’s MicroNiche Engineering (MNE) technology is taking place at Scottish Water’s Waste Water Development Centre at Bo’ness. The technology uses specific bacteria which eat pollutants in the waste water. It creates an environment for these bacteria – known as biocatalysts – to make them work more efficiently. It is designed to intensify the population of the bacteria, which are put in a special capsule to encourage them to work much faster. The process is designed to speed up the rate at which the good bacteria out-compete the bad bacteria. The technology was also developed to drastically reduce the amount of sludge – the residual, semi-solid material produced as a by-product during sewage treatment – created in the water treatment process. This happens due to the biocatalyst creating an environment where bacteria reproduction is limited. Reducing the amount of sludge produced cuts the energy requirements to manage bio-solids and requires less space for the treatment process. This can save not only energy but time and costs .It also means using fewer chemicals in the treatment process. In previous testing in the USA the sludge produced using Microvi was shown to be only a around a tenth of typical levels. The trial at Bo’ness will test the limits and conditions in which the biocatalysts can operate and see if this technique has the potential to transform how waste water is treated. Microvi’s technology was designed and developed in the US and is already used in parts of North America and Australia. The team at the centre will carry out rigorous testing of the new process from now until April after which Scottish Water will look at the findings to determine if the process would be useful and cost effective at any of Scotland’s waste water treatment plants. Dr Fatemeh Shirazi, Chief Executive Officer and Chief Technology Officer of California-based Microvi, said: “We are delighted to work closely with Scottish Water at its pioneering test and development centre. As we have seen at other demonstration projects in the UK, the Microvi MNE technology is positioned to deliver a paradigm shift in the way we treat wastewater while protecting health and preserving the environment. The centre provides three individual feeds of waste water from different stages in the treatment process. All discharges from testing areas enter back into the normal treatment process, offering a flexible and low-risk testing environment. There is also the provision for testing of new screening innovations at the inlet to the Treatment Works. Operated by the utility’s commercial subsidiary, Scottish Water Horizons, users can also benefit from UKAS accredited sampling and analysis services.